Henry McCarty, aka, William Henry Bonney, aka, Billy the Kid, was born on November 23, 1859, most likely in New York City. His parents’ names are not known for certain but his mother was thought to be Katherine and his father perhaps Patrick. History then traces Billy to Indiana in the late 1860s and Wichita, Kansas in 1870. 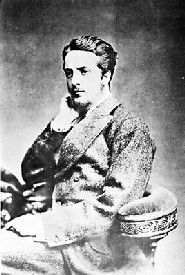 His father died around the end of the Civil War and at about the same time, Billy’s mother contracted Tuberculosis and was told to move to a drier climate. On March 1, 1873, Catherine McCarty married a man named William Antrim, who moved the family to Silver City, New Mexico. His stepfather worked as a bartender and carpenter but soon got the prospecting bug and virtually ignored his wife and stepsons. Faced with an indigent husband, McCarty’s mother took in boarders in order to provide for her sons. Despite the better climate, Billy’s mother continued to worsen and on September 16, 1874, she died of her condition. After her death, Antrim placed Billy and his younger brother Joseph in separate foster homes and left Silver City for Arizona. At the age of 14, the smooth-cheeked, blue-eyed McCarty was forced to find work in a hotel, washing dishes and waiting tables at the restaurant. The boy was reported to be very friendly. The manager was impressed by the young boy, boasting that he was the only kid who ever worked for him that didn’t steal anything. His school teachers thought that the young orphan was “no more of a problem than any other boy, always quite willing to help with chores around the schoolhouse”. However, on September 23, 1875 McCarty was arrested for hiding a bundle of stolen clothes for a man playing a prank on a Chinese laundryman. Two days after Billy was thrown in jail, the scrawny teen escaped by worming his way up the jailhouse chimney. From that point onward McCarty would be a fugitive. He eventually found work as an itinerant ranch hand and sheepherder in southeastern Arizona. In 1877 he became a civilian teamster at Camp Grant Army Post with the duty of hauling logs from a timber camp to a sawmill. The civilian blacksmith at the camp, Frank “Windy” Cahill, took pleasure in bullying young Billy. On August 17 Cahill attacked McCarty after a verbal exchange and threw him to the ground. Billy retaliated by drawing his gun and shooting Cahill, who died the next day. Once again McCarty was in custody, this time in the Camp’s guardhouse awaiting the arrival of the local marshal. Before the marshal could arrive, however, Billy escaped. Again on the run, Billy next turned up in the house of Heiskell Jones in Pecos Valley, New Mexico. Apache had stolen McCarty’s horse which forced him to walk many miles to the nearest settlement, which was Mrs. Jones’ house. She nursed the young man, who was near death, back to health. The Jones’ family developed a strong attachment to Billy and gave him one of their horses. Now an outlaw and unable to find honest work, the Kid met up with another bandit named Jesse Evans, who was the leader of a gang of rustlers called “The Boys.” The Kid didn’t have anywhere else to go and since it was suicide to be alone in the hostile and lawless territory, the Kid reluctantly joined the gang. Billy would enact revenge by gunning-down the deputy who killed his friend, as well as another deputy and the County Sheriff, William Brady. Now an even more wanted man than before, McCarty went into hiding but soon started to steal livestock from white ranchers and Apache on the Mescalero reservation. 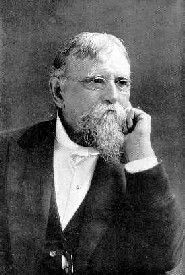 In the fall of 1878, retired Union General Lew Wallace became the new territorial governor of New Mexico. In order to restore peace to Lincoln County, Wallace proclaimed an amnesty for any man involved in the Lincoln County War that was not already under indictment. Billy was, of course, under several indictments (some of which unrelated to the Lincoln County War) but Wallace was intrigued by rumors that McCarty was willing to surrender himself and testify against other combatants if amnesty could be extended to him. In March of 1879 Wallace and Billy met to discuss the possibility of a deal. True to form, McCarty greeted the governor with a revolver in one hand and a Winchester rifle in the other. After several days to think the issue over, Billy agreed to testify in return for an amnesty. Part of the agreement was for McCarty to submit to a show arrest and a short stay in jail until the conclusion of his courtroom testimony. Even though his testimony helped to indict one of the powerful House faction leaders, John Dolan, the district attorney defied Wallace’s order to set Billy free after testifying. However, Billy was a skilled escape artist and slipped out of his handcuffs and fled. For the next year he hung around Fort Sumner on the Pecos River and developed a fateful friendship with a local bartender named Pat Garrett who was later elected sheriff of Lincoln County. As sheriff, Garrett was charged with arresting his friend Henry McCarty, who by now was almost exclusively known as “Billy the Kid”. At about the same time, Billy had formed a gang, referred to as the “Rustlers” or simply Billy the Kid’s Gang who he survived by stealing and rustling as he did before. The core members of the gang were Tom O’Folliard, Charlie Bowdre“, Tom Pickett, Billy the Kid, “Dirty Dave” Rudabaugh, and Billy Wilson. On December 15, 1880, Governor Wallace put a $500 reward on Billy’s head and Pat Garrett began the relentless pursuit of the outlaw. Garrett set-up many traps and ambushes in an attempt to apprehend Billy but the Kid seemed to have an animal instinct that warned him of danger, but that was not to last. 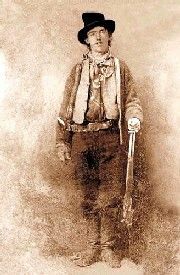 On November 30, 1880, Billy the Kid’s Gang, David Anderson, aka: Billy Wilson; and Dirty Dave Rudabaugh rode into White Oaks, New Mexico and ran into Deputy Sheriff James Redman. Taking shots at the deputy, Redman hid behind a saloon as several local citizens ran into the street, chasing the fugitives out of town. As a posse gave chase, the outlaws hid out at the ranch of a man named Jim Greathouse, who they held hostage. Accosted at dawn by a posse, they traded their hostage, Jim Greathouse, for Deputy Sheriff James Carlyle who was volunteered to negotiate with the outlaws in attempt to give themselves up. Continuing to surround the house, the posse waited for hours. Around midnight, the posse called out that they were going to storm the house. Just then a crash came through a window and a man came tumbling out. Shots ripped through the air and Carlyle lay dead. The bullet could have come from either the outlaws or the posse, but many suspect that the posse killed their own man. With this accident, the posse abandoned the siege and the outlaws escaped. Later Billy the Kid would be blamed for killing Carlyle. all you Billy Fans hope you can find it, and enjoy your visit.